The 25th Anniversary of TriBond is here! Play along here and be sure to share the TriBond of the Day! Place your mouse cursor over "Answer" below and the solution will pop up. Did you get it right? Play the board game that asks, "What do these 3 have in common?" and find out why TriBond has sold over 3,000,000 copies! We appreciate you stopping by to play. 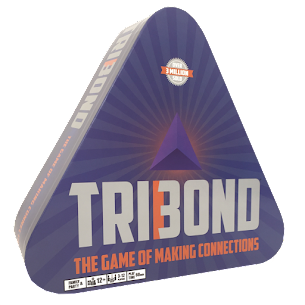 If you have any tips, tidbits, memories or stories regarding TriBond, please comment! 25 YEARS OF MAKING CONNECTIONS! © 2009-2014 TriBond Enterprises. All trademarks are the property of their respective owners. TriBond, and What do these 3 have in common are trademarks of TriBond Enterprises. © TriBond Enterprises. All Rights Reserved.. Picture Window theme. Theme images by Barcin. Powered by Blogger.